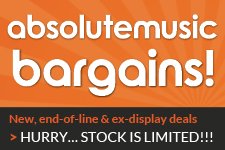 Here at Absolute Music we have a huge range of keyboards, synths, digital pianos, stage pianos, samplers and more ready to buy online. We love the diverse range of sounds that can be achieved from these fine instruments from an atmospheric analogue synth drone to a bright and beautiful stage piano, and you don’t have to break the bank to get the sound you are aiming for. We stock some of the best names in keyboards, digital pianos and synths including Korg, Roland, Moog, Yamaha, Nord and more, as well as all the relevant accessories including keyboard stands, cases, pedals and expansion cards. We are always updating our stock of keyboards and adding more of the latest products, so keep an eye on this section for updates. Alternatively, if you can’t find what you are looking for, or if you are simply not sure what you are looking for, get in touch with one of our experts to discuss your requirements, or even better… come and visit our keyboard demo room in our superstore to try some of our products for yourself. Joining Roland’s flagship range of stage pianos is the new RD-2000, equipped with dual sound engines, exceptional feel, and advanced controller features. This is going to be something special.